An Ebola outbreak in 2014 has already taken 887 lives. How does the virus look like? 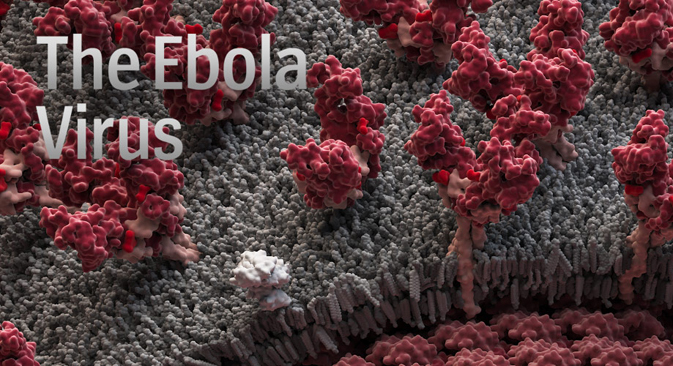 The Visual Science studio created scientifically accurate poster of the Ebola virus. The Ebola virus has a rod-shaped virus particle (virion) enveloped in a membrane taken from the host cell. It contains surface proteins that make the virus capable of infecting new cells and spiral genetic material. Genetic material is packed inside the virus particle along with the proteins that replicate it. In this model, viral proteins are shown in maroon shades and molecules taken by the virus from the host cell are shown in gray. In early August Russia sent two leading virologists to Guinea to help combat the Ebola epidemic. Russia’s chief infectious disease specialist Viktor Maleev and assistant of the Russian Research Institute of Virology Mikhail Shchelkanov are already in Conakry, the capital of Guinea, working in close contact with local experts. The hotbed of the epidemic appears to be the jungle of West Africa. Three countries have been affected so far: Guinea, Liberia, and Sierra Leone. As of August 4, the death toll stood at 889. The mortality rate is approximately 50%, much lower than in previous epidemics, when it reached 90%. Besides the above-named countries, cases have been registered in Nigeria and Hong Kong. Due to the number of cases (around 1800 at the last count), the outbreak is considered to be the largest since the virus was discovered in 1976. There is presently no vaccine against Ebola, which has led some researchers to postulate that the virus could be used as a biological weapon. In Russia there have been just two recorded deaths in connection with the virus — in 1996 and 2004. Both were the result of careless handling in the laboratory.